So there you are with your Today list, your to-do list, your project lists, your house list, your calls list and even your list of lists. You know each and ever one of the 49 things you want to accomplish today. There’s only one small problem: come the end of the day you’ve accomplished zip. What went wrong? Now you may think you know what the word focus means – but do you? Words have very specific meanings and too often people are vague about those meanings – they try to use soft blobby things to shape their thoughts instead of well-machined, razor-sharp chisels. It’s very easy when you make the leap to some sort of methodology for getting organized like David Allen’s Getting Things Done to not realize all your efforts for collecting and organizing what you need to do are only the start of the story – you’ve only jumped halfway across the stream. 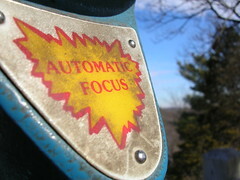 The other half of the story is developing, managing, conserving and applying focus to what you do. Create your to-do lists, then forget them. Not forever, not even for long. But the point of collecting and organizing your to do’s is precisely to get them out of your mind, to free yourself from their tyranny long enough to selectively complete some of them at a time and place of your choosing. Three things at a time. This is the technique I use to concentrate on and complete work. Know and be concerned about the next three things you are going to do, and that’s it. While I have pending 8 current tasks from the 374 in 26 projects (thanks to a program I wrote and sell) I’m only thinking about 1) This post. 2) A guest post to put up at http://mymicroisv.com and 3) a stubborn SqlBulkCopy routine I need to whip into submission for a client this morning. That’s it – I’m ignoring everything else, especially all those wonderful Internet distractions, until I get through my list of 3. Then, but only then, will I decide the next three things that most need doing. Don’t finish things, complete them. There’s a huge difference between finishing (“brought to an end”) a task and completing (“fully carried out”) a task. When you complete a task, you know you’ve done everything you should have to process that task, including defining new things you have to do because you’re done. You know you did it with just the appropriate amount of time, effort and creativity and yes, focus. Know when to multitask and when not to. There are times I’m answering email, chatting on Skype, surfing the web, reading RSS items and listening to music all more or less at the same time. None of these things need more than my partial attention, a bit of focus. But when I write code or words that matter to me, or dare to actually think about something, the email, Skype, browser, RSS reader and iTunes get turned off. It’s not that multitasking is bad; it’s when we try to multitask tasks deserving our full attention and not getting it that we cheat ourselves. Bob Walsh sells MasterList Professional, a Windows task management application and writes, codes, podcasts and blogs about different aspects of the digital lifestyle at ToDoOrElse, MyMicroISV and Clear Blogging. His second book, Clear Blogging, is now available at Amazon and elsewhere.